During my time as cellist of the Boston Public Quartet from 2011 – 2013, this was often how we would introduce our quartet and our umbrella nonprofit, musiConnects. With a multi-faceted organization, we needed a number of different phrases at our fingertips to quickly describe our work. Like any service-oriented business, the classical music scene has its fair share of jargon: Community-building! Outreach! Audience-engagement! Vehicle for social change! These terms help organizations to communicate the value and vision of their work in ways that capture donors’ interest, unite key players, and deepen impact. But as I spoke those words I wondered if I understood them well enough to wield them with such conviction - especially one catch-phrase we used frequently: social change through chamber music. Let me pause for a moment to give some context. After working closely with musiConnects my first few years out of college, I joined the organization, “From the Top” where I currently serve as the Arts Leadership Program Manager for the National Tour. 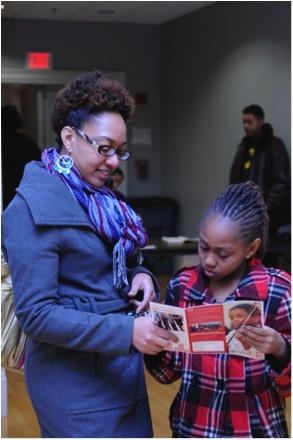 My work now involves engaging talented young classical musicians around the country as leaders in the arts. One thing I encourage them to do is share their thinking and personal stories with others. So in the spirit of putting myself in their shoes, I want to offer a story that I bring with me to each Arts Leadership Orientation – how I came to understand “social change” through my work at musiConnects. Chamber music rehearsal is a space where playfulness, improvisation, and constructive disagreement are all required to reach a shared goal. The subjects of discussion may be melodic contours, harmonies, and rhythms but the work also strengthens the students’ commitment to process while celebrating the developing product. This alone has long-range implications for “social change”. Teaching at musiConnects, I noticed that the social skills and attitudes learned in class empowered students to become contributing members of their communities. For instance, I remember seeing one of my new students playing kickball on the playground, intent on controlling the ball at all costs. He would kick it and throw it, sometimes even to himself, while the other boys and girls groaned at him. In music improvisation class, he was required to sit in a circle with his peers and create soundscapes with the group. The first time he tried a game called “Rhythm Machine” - which is all about building a collective sound - he did everything he could to focus all attention on him. It will take time to see how he applies his learning as an adult, but I found even by the end of that school year, he was out on the playground making sure people followed the rules and stepping back, knowing when it was time to let others take the lead. Beyond the classroom, the health of the afterschool program depended on help from parents/guardians. While the program is structured to minimize the burden on families in every way possible (offered free of charge and held at the students’ school immediately following dismissal), parents/guardians were called on to step up and rely on one another in ways they may not have before. Regularly, they were asked to contribute to the effort, from transporting kids home afterschool and to performance parties on weekends, to helping them develop a practice schedule based on teacher reports. What I found was families ended up sharing tasks and helping each other out to manage these and other responsibilities in their lives. When my eyes opened to the web of relationships that were sprouting I thought, “Great, but what if musiConnects could do more?” If we could just engineer the right balance of accessibility and accountability for parents/guardians, we could make even more of an impact on the connectedness of the community. So we added additional ways for them to participate, like joining a group sing at the end of class, volunteering to help with homework, and bringing favorite dishes to potlucks. These efforts influenced families’ sense of investment and it was apparent that the adults were getting more involved. Excited by the possibilities, I wondered where else we could have an impact – maybe could we help parents/guardians socialize more with one another and make friendships that extended beyond the program. I got a little overzealous. I was trying to manufacture a community for others instead of letting it develop organically. And in thinking of myself as an outsider to the community, I neglected a lesson our students had already learned in chamber music class – that to help strengthen the community’s commitment to process, I needed to celebrate the developing product as a member of the community myself. While I came in a total stranger to the Chittick Elementary School, the musiConnects program gave me the means to organically build relationships. I did not realize how much it was changing my own life until I found myself turning down other social and professional opportunities to participate in family potlucks, rehearse with the Boston Public Quartet, or attend my students’ school theatre productions (Seusical the Musical was a particular hit). I entered musiConnects thinking social change was about helping others establish connections and I left believing you can’t drive social change without allowing yourself to become embedded in it. I picture it like an enormous Venn diagram. First, our daily lives are spinning along, with circles apart from one another. Then they gradually move closer until those circles cross with greater and greater frequency and depth. “Social change” takes place at the intersection of all our little worlds and when we keep that awareness in front of us, we can embrace, strengthen and celebrate the villages growing around us. When I meet with the budding young artists who appear on From the Top, I carry this lesson with me. And with these stories in hand, I am better equipped to inspire and empower them to become agents, and participants, of change in their own communities across the country. To learn more about the From the Top Arts Leadership Program and ripple effects around the country click here: www.fromthetop.org Note the application for the From the Top’s “Center for the Development of Arts Leaders” which gives opportunities to use your music as a vehicle for change in Greater Boston!